Expectations of Far Cry 3 were already high, but Ubisoft have worked on so many features in this new first person shooter/adventure title that is hard to criticize the game, set for release in November 30. There’s a lot to like in the latest instalment of the popular Far Cry series – read on for our full Far Cry 3 review. 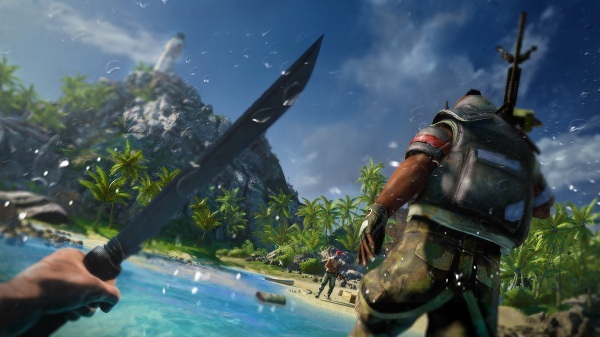 Far Cry 3 is a story about Jason Brody, who went with his friends to a bunch of beautiful islands – the only problem is, cruel, evil pirates, inhabit those islands. A man named Vaas kidnaps Jason’s friends, and you must hunt Vaas down to get them back. The campaign plays a lot on the ideals of you average everyday person. Jason is not a trained assassin, ex-army or even a gun-owner. He is very scared at first when his friends are taken from him and he escapes and hides out on the island. However, over time Jason becomes more inclined to exact some revenge, and to try and locate his kidnapped companions. What you see in Far Cry 3 is something hardly any open world game has been capable of showing you, a change in the character. We’ve often said that Fallout and Skyrim’s biggest drawback was that they cannot change the integrity of the character, they are always the same, no matter how much emotion the gamer feels. With Far Cry 3, Jason’s character and personality change over time. Jason becomes enraged and excited by the battle and longs to fight after a while, turning his back on his old ways and working with tribes to take down Vaas. Vaas, a central character in the game, is played excellently, as most every villain and character is on Far Cry 3. Not only does every character represent different human characteristics and have their own unique personalities, but various in-game cut-scenes showcase these traits and help you to get to better know the characters involved in the Far Cry 3 storyline. Ubisoft have made Far Cry 3 a great setting for gamers that like to explore and have added various side-missions and adventure quests that you can do once you have a little spare time. The game is hugely open and one of the biggest worlds we have ever seen, but Far Cry 3 has a lot surrounding it, so you do not feel like an island or area is unnecessary. Without a doubt, this is one of the most mature and most incredible open world campaigns we have ever seen. Far Cry 3 combines the sense of a human approach, rather than almost robot-like gameplay – there are tons of different ways to do a certain mission and the character feels real and changes as the game goes 0n. The campaign in Far Cry 3 is the real selling point for this game, and is the main reason a gamer would want to get a hold of this title, as the multiplayer and co-op aren’t as impressive as other first person shooters. Far Cry 3 comes highly recommended, if only for the campaign, as it is one of the best we have played in years. What’s your review of Far Cry 3? Let us know in the comments.